Last week we looked at the performance of Aiden O’Brien trained horses running in Group races. As an exercise for the reader it was suggested to look at the combination of both Aiden O’Brien and Ryan Moore in Group races. The result was that this combination showed an overall profit since 2007. The R code was provided at the end of the article and this will be used as the starting point today. Rather than show all code during the article, it is assumed the reader can now connect to the Smartform MySQL database and retrieve basic data. Nonetheless, the full R code for today’s investigations will be provided at the end of the article. Starting with O’Brien and Moore in all Group races since 2007. The chart and profit and loss calculations indicate a small profit of 10.31 for a one unit stake across all 377 runners in the dataset. Decent enough, however, we should always ask if this is the full story. One way of investigating further is to create a scatter plot of the Starting Price for all O’Brien and Moore winners. 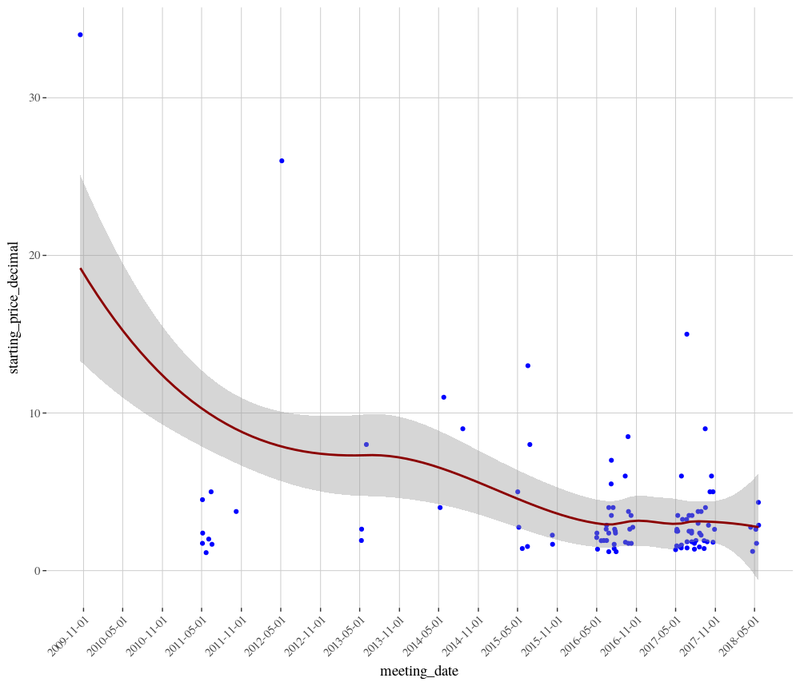 The ggplot library is again used for this. There are many very powerful features of this charting tool and a wide number of tutorials available online. This very interesting chart includes a loess regression line with confidence intervals. The line indicates that the price of O’Brien and Moore winners has been reducing over time, although it also appears that the confidence interval narrows (a good thing!) as the number of rides increases. The slight increase in confidence interval in 2018 is due to the fact the season is not yet half completed and the overall number of runners for this combination is low so far this year. The chart also clearly shows that the overall Profit and Loss is probably skewed by the big priced winners in 2009 and 2012. If these two rides were removed, the combination would show an overall large loss. We could also plot every individual runner for this combination, with a separate regression line for both winners and all other runners. In the chart below, winners are the blue points and all other runners are orange. This chart shows that there are tight clusters of winners and runners in 2016 and 2017. 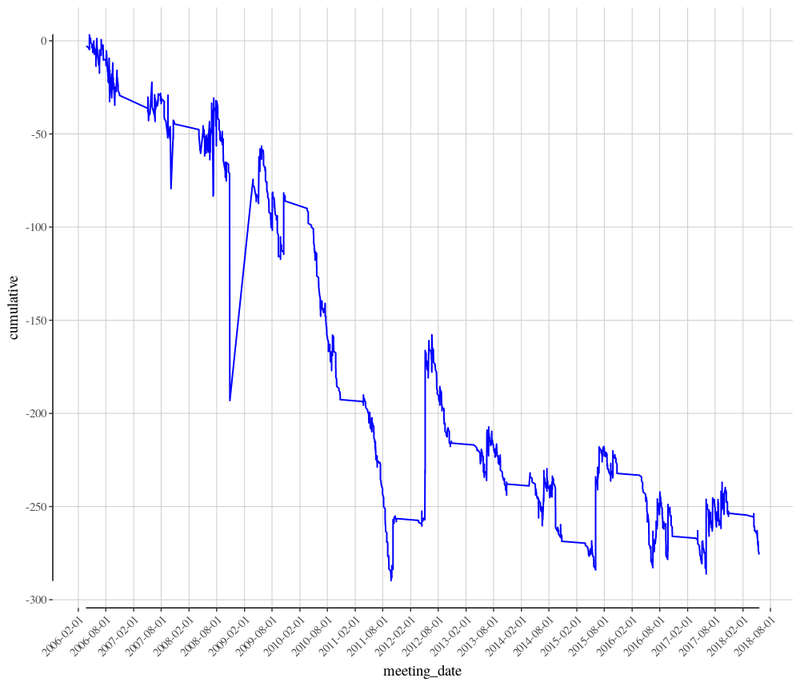 We can also see that the starting price of winners has been contracting faster than the overall price of all starters for this combination. As bettors, we should always keep in mind the value proposition of a bet. Next, we could filter the data and examine just runners from the 2016 season onwards, with a starting price of less than 4.00. We now have a very healthy 22.67 profit from 133 runners over the last two seasons, with a strike rate of 49.62%. This seems like a quite nice angle into Group races where Aiden O’Brien has a horse ridden by Ryan Moore. The chart shows that 2016 was a bit slow to begin with, but than picked up nicely from around June onwards. However, 2017 was a very strong year. This year, 2018, seems to be off to a decent start. There are many, many different ways of investigating further. Today’s races includes the Irish 2000 Guineas at the Curragh, as well as some other Group races on the same card. Are there any O’Brien and Moore qualifiers? There are three qualifying horses – US Navy Flag in the Irish 2000 Guineas, Merchant Navy in the Group 2 Greenland Stakes and Hydrangea in the Group 2 Lanwades Stud Stakes, all at prices less than 3/1. Are all three worth a bet? There’s always something else to consider. Why did Ryan Moore’s number of rides and winners increase markedly from 2016 onwards? In March 2016 Joseph O’Brien announced his retirement from race riding. Ryan Moore most likely then picked up a number of high quality rides which would have otherwise gone to Joseph. In the 2000 Guineas at Newmarket a few weeks ago, another of Aiden O’Brien’s sons, Donnacha, had a winning ride on Saxon Warrior. This may have only been because Moore was otherwise engaged for Ballydoyle at the Kentucky Derby. What are the current internal dynamics at the stable now? Has Donnacha’s success elevated him in the pecking order? Donnacha O’Brien rides Gustav Klimt in today’s 2000 Irish Guineas. How important is this race for the stable? Is it an opportunity for Donnacha to ride another Group 1 winner? Of the three qualifying horses today, is it worth considering not betting on US Navy Flag? Racing is never an easy or straightforward game. Previously we looked at how to calculate the strike rate for jockeys, specifically with relation to those riding in the 1000 Guineas. The result of that race showed how strikes rates are really only part of the overall picture. Sean Levey had the lowest historic strike rate for Group races, of all those peforming in the 1000 Guineas, yet rode a convincing winner. If we had of looked at trainer strike rates, it may have been a different story. This article will now look at trainer strike rates, but also specifically calculate the profit and loss (P&L) to show what would happen if one had backed every runner for a specific trainer at starting price (SP) in all Group races. We start very similar to previously, returning historic data from the Smartform database and calculating trainer strike rates. # This SQL query selects the required columns from the historic_races and historic_runners tables, joining by unique race_id and filtering for results only since January 1st, 2006. The SQL query is saved in a variable called sql1. # Now execute the SQL query, using the previously established connection. Results are stored in a variable called smartform_results. The variable trainer_group_data now contains the strike rate for every trainer who has had a runner in a flat or all weather Group race since January 1st, 2006. The Group 1 Lockinge Stakes is run today at Newbury. Therefore, let’s look at this field only for today’s examples. # This SQL query selects the required columns from the daily_races and daily_runners tables, joining by unique race_id and filtering for results only with today's date. The SQL query is saved in a variable called sql2. # Now execute the SQL query, using the previously established connection. Results are stored in a variable called smartform_daily_results. The variable smartform_daily_results contains information about all races being run today. Now we filter for just today’s Lockinge Stakes. The variable lockinge_only now contains just the basic details for today’s Group 1 Lockinge Stakes. Lastly, dplyr is again used to perform a different type of join, which combines the lockinge_only and trainer_group_data dataframes, using trainer_name as the key. 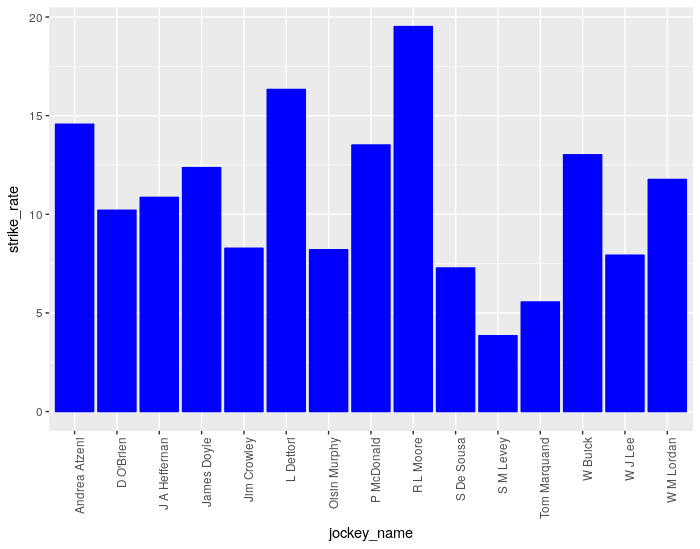 If we now view the dataframe lockinge_only_with_sr we can see that the trainer with the best strike rate in Group races, with runners also in today’s Lockinge Stakes, is Aiden O’Brien. No real suprises there perhaps. However, what would now happen if we’d placed a one Pound bet on every Aiden O’Brien runner in Group races over the last twelve years. Would we have made a profit? To begin, we filter all historic Group races, from the data obtained earlier, for just Aiden O’Brien’s horses. The dataframe obrien_group_races_only now contains the data we need. The next step is to cumulatively sum all the start prices for winning horses and deduct our one Pound stake where appropriate. The cumsum function is used to achieve this. The ifelse statement below basically says, for all lines in the dataframe where the finishing position is one, use the decimal starting price but also subtract our initial one Pound stake, otherwise (if the finish position isn’t one) simply subtract our one Pound stake from the total. When viewing the dataframe obrien_group_races_only you will now see a new column included called cumulative. 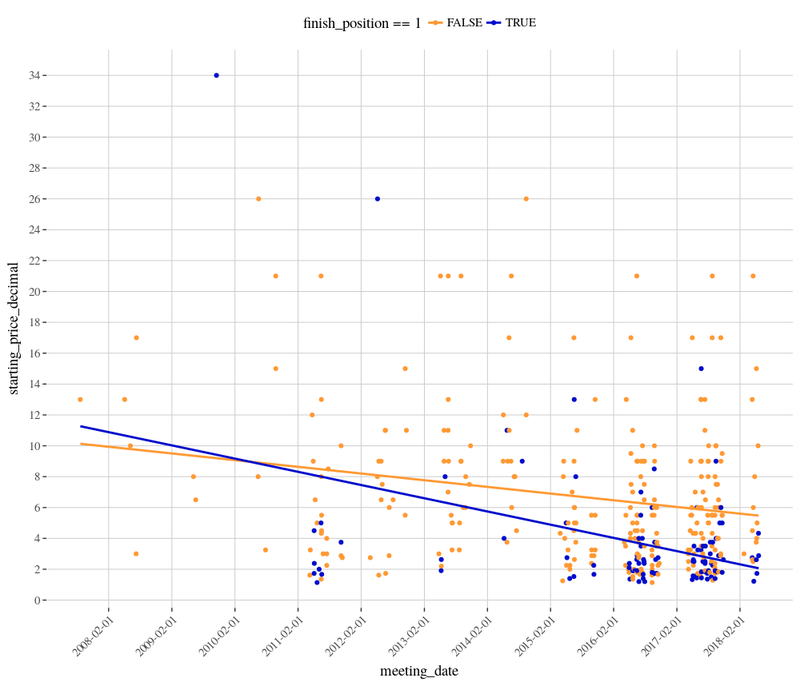 Looking at the last entry for this column in the dataframe, the results is -275.76. Therefore, a single Pound bet on all 2178 Aiden O’Brien Group race runners since 2006 would have resulted in a loss of £275.76. Not really the route to profitable punting. We can also take this a step further and plot the results for something more visual. 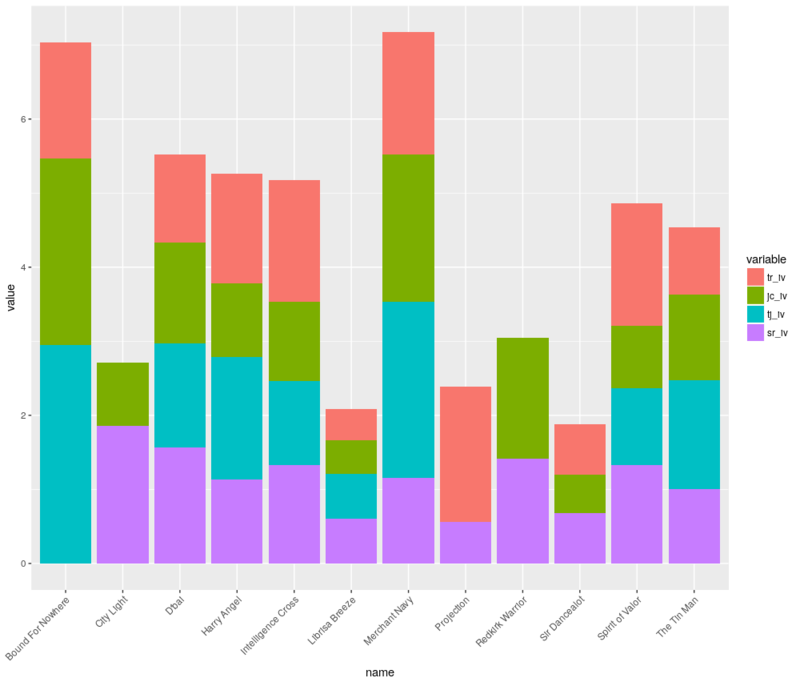 The code below uses the gglot2 library again, along with some helper libraries in order to make a prettier chart. The years 2009 through to the end of 2011 look to be particularly poor years for Aiden O’Brien in Group races, but 2014 onwards has been much more stable. Today we have shown that just because the trainer may have the best historic strike rate in Group races, backing all of their runners blindly does not necessarily result in a profit. The market obviously knows the A P O’Brien has a very good record in these types of races and his horses are priced accordingly. An exercise for the reader could be to calculate the P&L for Aiden O’Brien runners when ridden by Ryan Moore. To do this, start by filtering the historic obrien_group_races_only data by R L Moore. Hint: The answer is they are an profitable combination over 375 runs since 2006. Questions and queries about this article should be posted as a comment below or to the Betwise Q&A board. 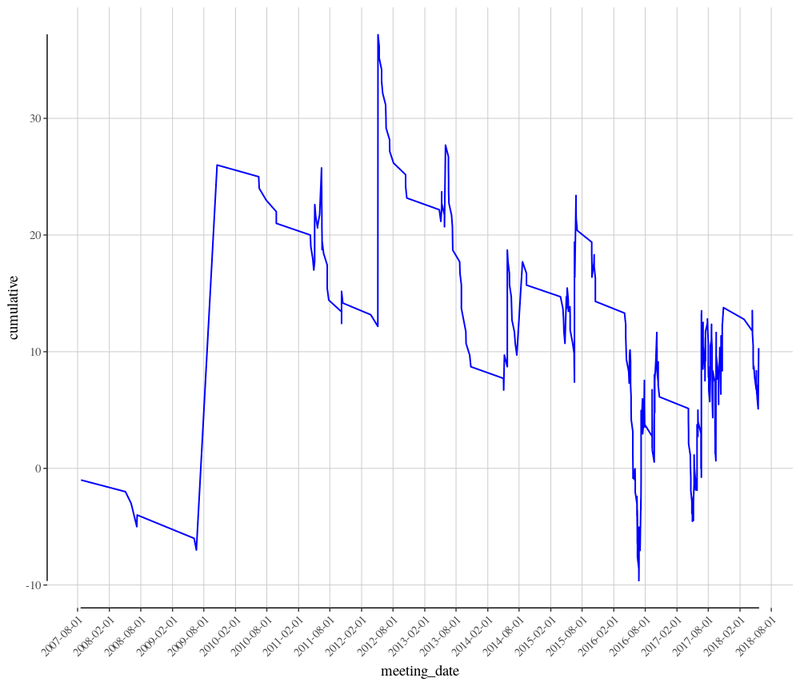 Today we’re going to build on the last SQL post where we created a query for 14 day strike rates for all trainers who had runners in the past 14 days. It’s all very well knowing how trainers have performed in the last 14 days, but in practice the way we’ll typically want to use that information is to match the strike rates with today’s runners, so we can compare trainer strike rates within a race. That is what today’s query is going to show. We’ll be converting the query from the last blog post to a new database table, then querying that table with a left outer join combined with data on today’s runners. First, here’s the query that you can run in Smartform yourself, then we’ll explain what is going on. Having created a temporary table with the trainer statistics, we now want to join this data to the race card. To this we also want to the join the temp_trainer_stats_table we have just created – for this we use a LEFT OUTER JOIN. This type of join ensures we have the data for every runner in every race on the card, and the trainer data for trainers for which it exists. For each table I use an identifier eg. Dra for daily_races, tmp for the temp_trainer_stats_table, this enables correct identification of data fields which exist in more than one table. Time – for this I am using a substring function of the scheduled_time data element, the whole value is for example 2018-05-06 13:30:00 using substr(dra.scheduled_time, 12,5). I am using 5 characters from position 12 which gives me 13:30. Running the first query gives us a result set of 488 rows, neatly ordered by rate time for each of today’s races. We’ve attached a CSV of the output for all today’s races, so you can analyse each race according to trainer strike rate and profitability – something you can of course do for yourself every day in Smartform. In the next post, we’ll look at different options for automating this query on a daily basis. Last week we looked at a very simple use of Smartform and R to calculate a single jockey’s strike rate. While a decent introduction, the outcome was not particularly useful. Today we’ll extend this example, in a topical manner, to calculate the Group race strike rate of every jockey riding in the 1000 Guineas at Newmarket. The variable smartform_results now contains a large selection of historic data, which can be used to filter and calculate jockey strike rates. In R there are always multiple methods to achieve the same result. The example code used in this article tries to keep things simple, laying out the steps in a logical manner. There are cleaner, faster and perhaps better ways to achieve the goal, some of which will be explored in future posts. The variable group_races_only now contains details of every Flat and All Weather Group race in the Smartform database since January 1st, 2006. The variable jockey_group_data now contains the strike rate for every jockey who has ridden in a flat or all weather Group race since January 1st, 2006. While this may be interesting data, it is perhaps not particularly useful on its own. There are some jockeys with a 100% strike rate, from just one ride. Next step is to apply this data to today’s 1000 Guineas at Newmarket. To begin, another SQL query is required to return daily racing data. The next step is to filter just for the 1000 Guineas. To do this, a grep command is used, which conducts a string match on the race_title field. The variable guineas_only now contains just the basic details for today’s 1000 Guineas. Lastly, dplyr is again used to perform a different type of join, which combines the guineas_only and jockey_group_data dataframes, using jockey_name as the key. 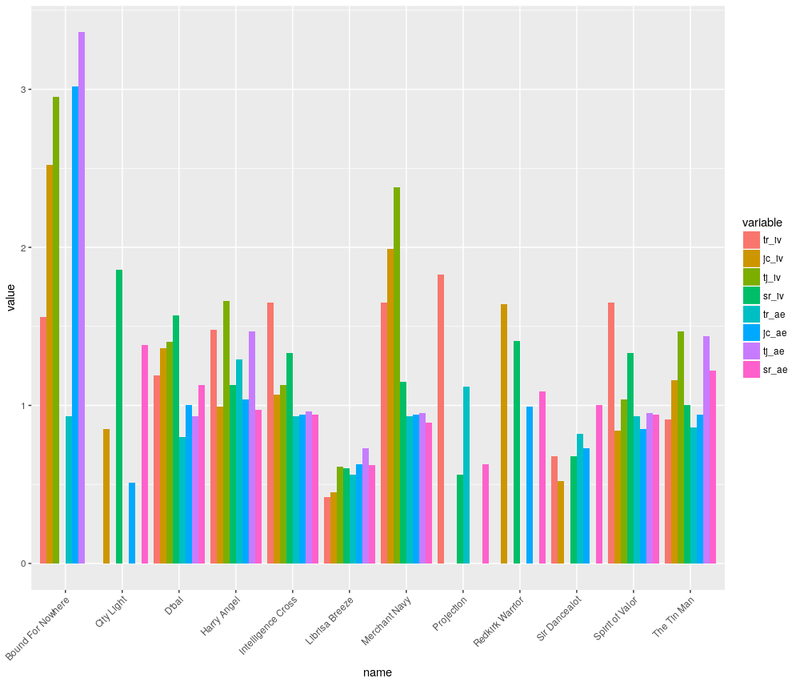 This results in a new dataframe, guineas_only_with_sr, which contains three new columns, group_rides, group_wins and strike_rate. It should be no surprise that Ryan Moore has the highest strike rate, from a very large sample size of rides, followed by Frankie Dettori, also with a solid number of rides. Jockeys such as Jim Crowley and Silvestre De Sousa should be carefully considered, as they both have a significant sample size of rides, but quite a low winning strike rate. Looking at such a table is interesting, but not very visually appealing. Some people also understand data better when it is presented in chart form, rather than simple numbers in a table. Therefore, we’ll now briefly look at plotting jockey’s Group strike rates as a bar chart. This chart makes it obvious that Moore and Dettori have the two superior strike rates when riding in Group races. 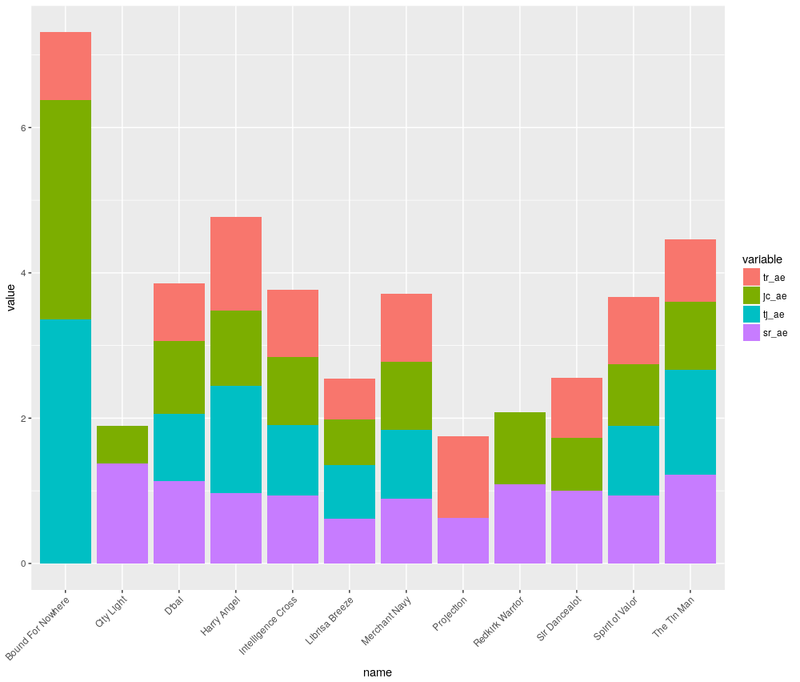 Ggplot is a very powerful charting library, with huge number of options. An Rstudio cheatsheet helps to explain some of the most common options. Further information regarding using the dplyr library, which has a wide range of very useful data manipulation functions, can be found in this RStudio cheatsheet. This tutorial could be easily extended to produce trainer or even sire strike rates in Group races, which could provide further useful insights into today’s 1000 Guineas. There are many ways to skin a cat in Smartform. One of the simplest is to stick with SQL and stay in the database, without resorting to programming or exporting the data. So here is a breakdown of how to generate one of the most commonly used “derived” statistics in horseracing – trainer strike rates. We hear that trainers whose horses are currently in good form are worth backing – but how can we tell? The approach is to generate a query within a query – to allow the use of the counts done in the main query to be used to create the strike rate percentages. The main part joins the historic_runners and historic_races tables by race_id. The outer section of the SQL selects all the data from the inner part and displays it and calculates the strike rates. The )a afterwards is required by SQL. Finally in Green are the sorting instructions and some other criteria. Also note that here I am choosing to only display trainers who have had at least 5 runners or at least 3 winners. So on the day of the 2000 Guineas, Brian Meehan is currently the most profitable trainer to follow, with £47 retuns, but P W Hiatt has the highest strike rate, with 60% – albeit with only 5 runners in the last few days. If you’re looking for a trainer with a high strike rate from at leasy double digit runners in the last 14 days, then Mark Usher, with a 33% win strike and 25% place strike, is impressive. 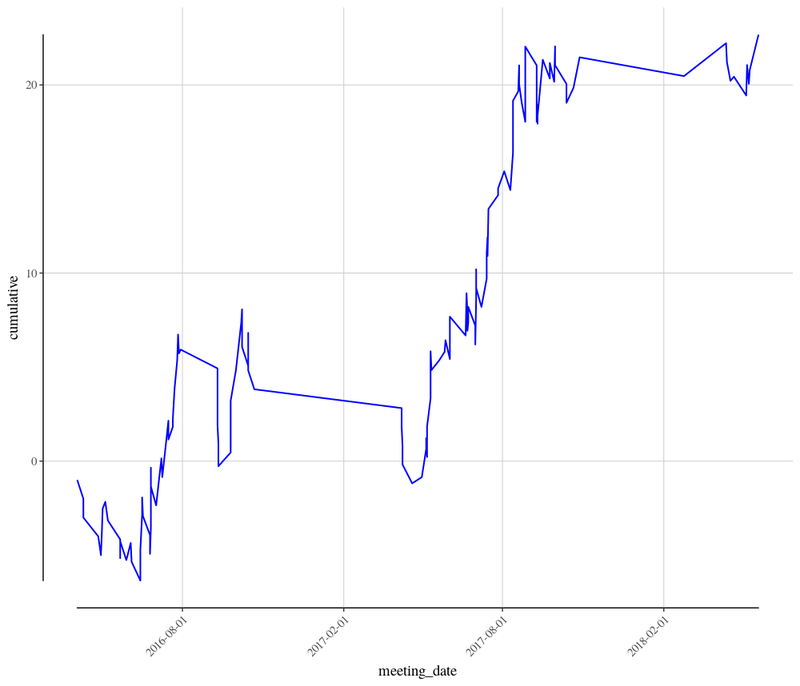 Adapt the SQL above to generate daily trainer strike rates so you can judge for yourself.